A year ago, Yoshimura Suzuki’s Toni Elias came into Georgia fresh off his two wins at the Circuit of The Americas. After seeing the 2.54-mile Road Atlanta track for the first time during Thursday’s track walk, Elias had wide eyes and plenty of trepidation. He said the track, with its varying undulations and blind corners, was unlike any he’d ever seen. Come race time, Elias knew where he was going and he went out and won race one, proving his mettle as fast learner. Although he suffered a crash in Turn 5 in Race 2 that would ultimately prove costly to his championship aspirations, he still left as a fan of the racetrack. This weekend, Elias again returns to the Suzuki ECSTAR Championship at Road Atlanta as the points leader after, once again, sweeping to wins in both races in the Motul Superbike class at COTA. This time he’s got Road Atlanta’s 12 turns etched in his brain and with an appreciation and fondness for the racetrack. Although Elias won both races at COTA last weekend, both Motul Superbike races were hard-fought. In Saturday’s final he had his Yoshimura Suzuki teammate Roger Hayden nibbling at his heels for the duration with a margin of victory of 1.7 seconds. On Sunday, he had his hands full with Hayden and Monster Energy/Yamalube/Yamaha Factory Racing’s Cameron Beaubier for the entire race with Beaubier bouncing back from a crash on Saturday to finish second, 0.716 of a second behind Elias. 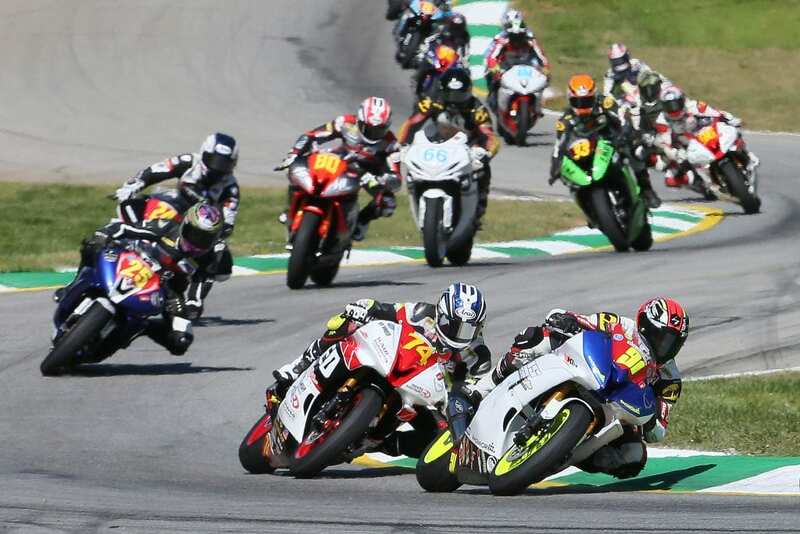 This year’s Suzuki ECSTAR Championship at Road Atlanta will feature a Motul Superbike race on both Saturday and Sunday, unlike the first two seasons of MotoAmerica when both Superbike races were held on Sunday. Both are sure to entertain. With practice and qualifying taking place on Friday, racing action begins on Saturday with the Supersport/Superstock 600 race at 2:25 p.m., followed by the first 21-lap Motul Superbike/Bazzaz Superstock 1000 races at 3:30 p.m. The day will conclude with the first KTM RC Cup race at 4:35 p.m.
Sunday’s main events start at 11:30 a.m. with the second KTM RC Cup race and the one-off WERA Superbike race, which is the opening round of WERA’s Triple Crown Series. The final two races of the day are the second of two Supersport/Superstock 600 and Motul Superbike/Bazzaz Superstock 1000 races.